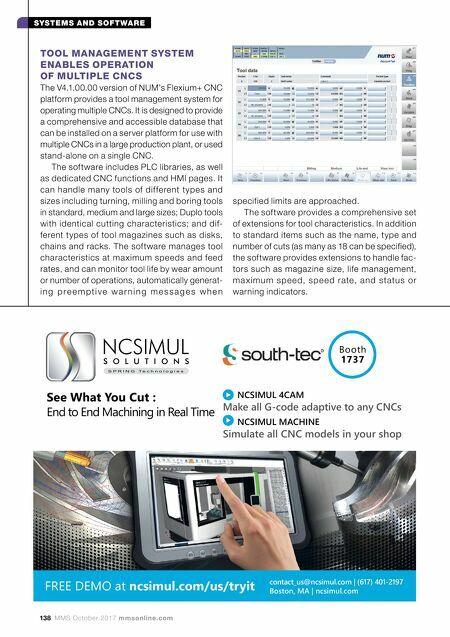 138 MMS October 2017 mmsonline.com SYSTEMS AND SOFTWARE S P R I N G T e c h n o l o g i e s NCSIMUL S O L U T I O N S NCSIMUL MACHINE Simulate all CNC models in your shop NCSIMUL 4CAM Make all G-code adaptive to any CNCs Booth 1737 FREE DEMO at ncsimul.com/us/tryit See What You Cut : End to End Machining in Real Time contact_us@ncsimul.com | (617) 401-2197 Boston, MA | ncsimul.com TOOL MANAGEMENT SYSTEM ENABLES OPERATION OF MULTIPLE CNCS The V4.1.00.00 version of NUM's Flexium+ CNC platform provides a tool management system for operating multiple CNCs. It is designed to provide a comprehensive and accessible database that can be installed on a server platform for use with multiple CNCs in a large production plant, or used stand-alone on a single CNC. 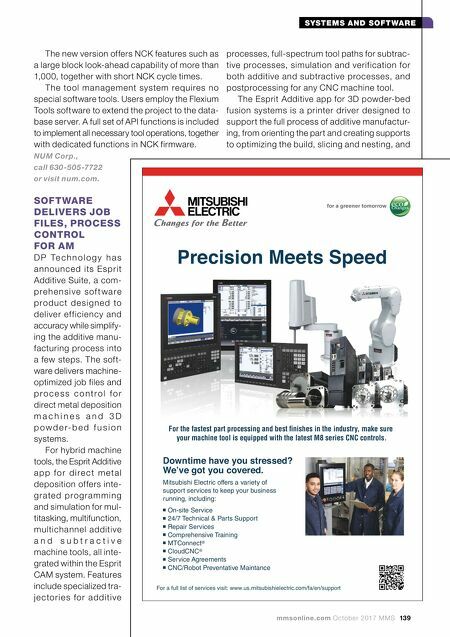 The software includes PLC libraries, as well as dedicated CNC functions and HMI pages. It can handle many tools of dif ferent types and sizes including turning, milling and boring tools in standard, medium and large sizes; Duplo tools with identical cutting characteristics; and dif- ferent types of tool magazines such as disks, chains and racks. The software manages tool characteristics at ma ximum speeds and feed rates, and can monitor tool life by wear amount or number of operations, automatically generat- i n g p r e e m p t i v e w a r n i n g m e s s a g e s w h e n specified limits are approached. The software provides a comprehensive set of extensions for tool characteristics. In addition to standard items such as the name, type and number of cuts (as many as 18 can be specified), the software provides extensions to handle fac- tors such as magazine size, life management, ma x imum s p e e d, s p e e d rate, a nd status or warning indicators.